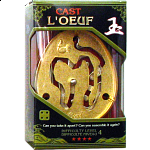 People who purchased Cast L'oeuf also purchased the following puzzles. I didn't use to be a fan of maze puzzles but this one is so good that turned me into one. This puzzle does NOT need force, it just needs proper alignment. The design is incredible how with 2 simple mazes, a much more complicated one arrises and how you are forced to go back and forth to get to the final solution. Designing this must have been really fun! Even though I don't care much for the maze-style puzzles, I rated this one at five stars because it is a great example of the type. 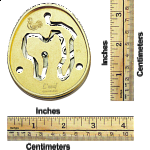 It is kind of oversized, which is necessary because of the thin sections of metal in some parts. Like a few others in this series, it really isn't suited to be made by casting. If it were laser cut from steel plate it could be smaller and stronger. As other reviewers noted, you should be careful not to damage the thin metal strip that is clearly seen in the photo above. 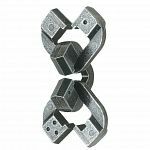 Also, in one tricky part of the solution, it is possible to cheat by forcing the pieces and allowing that thin strip to spring to one side. You'll just have to rely on your will power to avoid that shortcut. I did not enjoy this puzzle. It is more trickier than you may expect, even after reading the warning on the description. For me, it is an egg from hell. At several points I need to use some force to proceed (points part of the solution path) and I have a feeling that one of the pieces can break any time soon. What I really like is the design - I doubt that the paths were created without the aid of a computer. I think I should clarify something posted by the other reviewers. This puzzle, like all Hanayama puzzles, is meticulously designed and crafted to be challenging and solvable WITHOUT forcing or breaking any parts. Yes, there is one particular section of the path that seems very tight to navigate through. It's a red herring - if you find yourself needing to force the puzzle, you've gone down the wrong path. Back up, try to rotate the pieces a different way and try the path again. 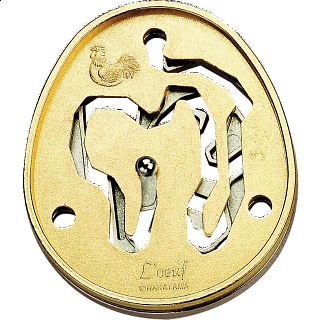 This is my favourite of all Hanayama puzzles for many reasons. I think it's a brilliant design (how do they come up with these ideas?!? ), and it's very satisfying for tactile people like me. It's fairly rated as an 8 difficulty. The first few tries took me over 20 minutes to solve, now I can get it apart and together in under 5 minutes. A hint to solving this one: you need to backtrack a lot in order to move forward. Don't force anything. Buy this puzzle. Enjoy it as much as I do. It was great fun unless it broke. Ok, I admit that it was heavily used (not forced, but used many times). So if you want a puzzle that will serve you for ages than I don't recommend it. Pretty good puzzle, but not too difficult. It took me about a half hour to take it apart and put it back together. It is easy to bend the narrow strip of metal that George referrs to (on the right hand side of the picture), but you just have to keep an eye on it and use the button to bend it back. Nice puzzle, but my copy is misaligned. 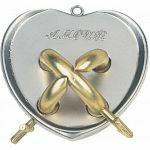 There is a narrow strip of metal in this puzzle, if it bends slightly you have to force the button along the track.